Stephen Neville has specialised in Financial Services Law for over 25 years. He has provided the key regulatory compliance reviews for many of the largest acquisitions of CCA and FCA regulated portfolios and businesses over the last decade. Lenders: American Express, Lloyds, Barclays, Sainsburys Bank, Argos Financial Services, Handelsbanken, Optimum Credit, Bradford & Bingley, Mortgage Express, Redstone Mortgages, First Plus, Southern Pacific, Preferred Mortgages, RBS, Manchester Building Society, Societe Generale, Virgin Money, Amigo Loans, HSBC, GE Money, HBOS, Citigroup, MBNA, the Co-op, Northern Rock, Nationwide, Black Horse, Provident, Kensington Mortgages, ING, Lombard, Capital One, Capital Home Loans, Mortgages plc, Irish Life & Permanent, Ulster Bank, BNP Paribas, and Banco Bilbao. Retailers/Suppliers: Apple, Dell, Tesco, Prudential, La Redoute, Virgin Media, T-Mobile, Axa, Jordon, Marriott, Aviva, Moss Bros, Evans Cycles, Brighthouse, Volkswagen, Land Rover, Mitsubishi. Debtor Acquirers: Lowell, 1st Credit, Arrow Global, Marlin. Representative organisations: Credit Services Association, Finance and Leasing Association. Stephen advises banks and other finance providers on compliance with the FCA Handbook, the Consumer Credit Act 1974 (“CCA”) and the Financial Services and Markets Act 2000. He has drafted many hundreds of templates for loan and security documentation, covering a wide range of financial products, including fixed sum and running account loans, credit cards, first and second mortgages, guarantor and payday lending, timeshare, litigation finance, shared equity schemes, pawn, hire, conditional sale, employee share purchase, and deferred payment for goods or services. – the UK’s largest guarantor lender. – the financial services arm of a retail group acquired for £1.4 billion. – a £4billion portfolio of consumer loans. – a company with 14 million FCA regulated accounts in arrears. – a portfolio of £1billion of pre-2008 FCA regulated mortgages. He has also reviewed enforceability and compliance for a wide range of securitisations. Stephen has drafted standard terms and conditions, and web pages, for many major retailers – including Apple, T-Mobile and Dell – and advises on, and litigates, disputes over contracts for the supply of goods or services. Also, he has made representations, on behalf of clients, to Ofcom, the Advertising Standards Authority, BIS, the Treasury, and the Financial Ombudsman. DTI v Arif (Ch): director’s disqualification. 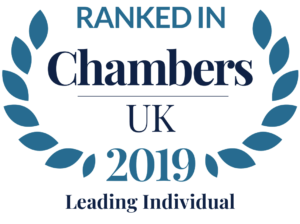 “Stephen is extremely knowledgeable in this area”– Chambers and Partners 2018. “An advocate whose advice is clear throughout a case”. “He regularly drafts agreements, conducts reviews and advises on securitisations, acquisitions and new products for finance, insurance and private equity clients”. “…Incredibly able” …. “Applauded for his technical excellence” …”Stephen Neville is not only “extremely commercially astute” but also “personable, highly intelligent and a pleasure to work with”. Currently writing the Payment Services and Mortgage Conduct sections of the loose-leaf Encyclopedia of Financial Services Law (Sweet & Maxwell). He was co-author of “The Law of Consumer Credit and Hire” (OUP), and the “Atkins Court Forms” volume on “Consumer Credit” published in 2008. He studied law at St. John’s College, Cambridge from 1979 to 1982, winning the McMahon Law Scholarship whilst there for being one of the best of his year. After graduating, he travelled widely in Asia and Latin America before being called to the Bar in 1986. Stephen is authorised to accept Direct Access instructions and will act on this basis for businesses and professionals.